10 Wilmington Place was very large, about three or four stories, and there was a lot of walking involved. They offered significantly more activities than the other places we visited, but the size would be overwhelming. The rooms were very nice, spacious, clean, and affordable. They have two actual movie theaters, a men's club, and several card clubs. My mom is in 10 Wilmington Place. It is a beautiful Victorian building and very affordable. I am impressed at how nice and how affordable it is. I will recommend it. However, the only concern I have is that it is in the area that may have high crime. Outside of that, I really think it is great. My visit at 10 Wilmington Place was very good. They gave me brochures, and the lobby was very nice. It was a very large facility because it used to be a hospital. The rooms were very nice, clean, and didn't smell bad. It was staffed well. The price was really expensive but fairly reasonable. I met the sales representative, and she was helpful, informative, and clearly told me everything they had to offer. The friendliness of the staff and the residents in 10 Wilmington Place was really different, and I liked it. It was a beautifully furnished facility. They found us a beautiful room with lots of storage. Wilmington Place is very nice, and the rooms are OK. They’re a little bit on the small side, but the grounds are fantastic. It’s beautiful because it’s upon a hill and surrounded by a lot of acreage. When we were there, it seemed to be clean. We visited three facilities, and my favorite was Wilmington Place. The staff seemed to be very caring. The facility had tons of stuff for people to do. The thing that I noticed about this particular place was everyone was outdoing stuff. They had a bar and movie theater. Everybody looked happy, that was what I have noticed that I haven’t seen in any other place. The rooms were nice; the 1-bedroom was very spacious, nice, and very clean. I haven’t tried the food, but I know a couple of friends whose parents have been there, and their chef has been there for 10 years. The security was very good. I went to 10 Wilmington Place one time. It was a larger facility compared to the others I visited. But I preferred a small place. It was also in town and I did not want to drive a lot. They had a chef and the food was very good. The price was also a little higher than the others. Ten Wilmington Place had much to commend it. I found the entrance and dining room to be adequate only because it felt like a hotel entrance with dark colors -- and the food was only average. I did appreciate that the apartments were varied in appearance that I found pleasant. If I remember correctly they no longer had banking services which is a very necessary service for persons who no longer drive. For such a large facility I expected a small-type grocery/basic personal items on site. All things considered, I felt the prices were somewhat higher than I expected. There were things about 10 Wilmington Place that I didnt like. It's a very spread out, older building that they've adapted so there's a lot of ramps that cause my mother-in-law to walk further. There's a main building and wings off to the side. The rooms were great and spacious, but the wings were long, so it's a further distance to walk. Their amenities were great, and the food looked really good. They had music concerts and other activities, like classes and stuff like that, and a salon inside. 10 Wilmington Place has a lot of activities. There are two movie theaters and nice dining facilities. The rooms don't have an outdoor seating area, but there have a lot of areas where they can go outside. The place was very neat, clean, and the staff was very helpful. It was quite a bit higher-priced. My mom moved into 10 Wilmington Place this April. She has a nice room. 10 Wilmington Place is excellent. Everybody is very pleasant. They have all kinds of activities, movies almost every afternoon, and card tournaments. They have a beauty salon and a small general store. The staff members have been very accommodating and pleasant. My mom likes the food. She has a choice of three entrees and chooses to take one meal a day, but she could take two meals a day. Plus, they have a continental breakfast. Thank you for your very kind words. Our owners and management team strive to ensure that our residents have the highest quality of life possible, as well as beautiful place to call home. We are so pleased to know that you and your mom are happy she chose 10 Wilmington Place. 10 Wilmington Place was quite a wonderful place and the most active of the ones I've seen. I was very impressed that their chef prepared very healthy food. The people were very friendly. The dining room was buffet-style. It was such a perfect experience. My grandmother is at 10 Wilmington Place. It's an older community. I like the location. However, I don't like that they have four floors and higher turnover. The staffing is very inconsistent. The food doesn't look too promising either. They have a movie theater, a bar, a laundry room, a gazebo, and a restaurant. Thank you for sharing your thoughts about 10 Wilmington Place. Ours is indeed an “older community”. In fact, 10 Wilmington Place was originally built in 1855 and is even listed in the National Register of Historic Places. However, since opening in 1986, our property has been completely renovated twice - most recently in 2017. We staff our community according to the resident population we are serving, taking into account the collective daily needs of our residents, which may account for some of the inconsistencies you mentioned. 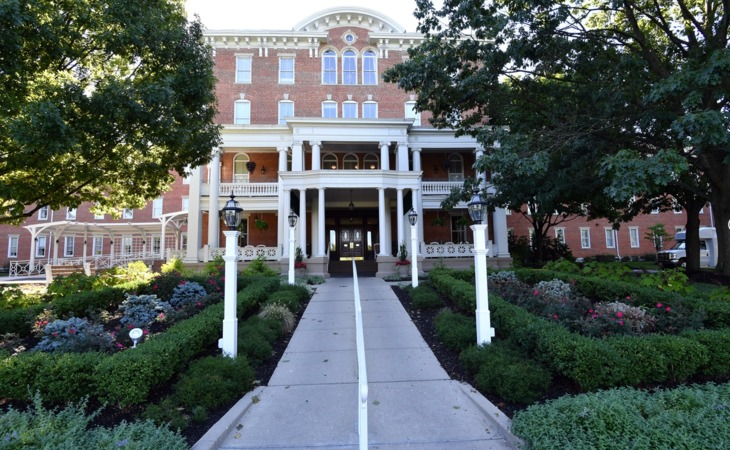 We are a proud to have received a perfect score on our annual survey by the State of Ohio Department of Health in 2018 – a distinction very few area senior living communities can claim. Several of our key managers and staff members have been with our community for more than 10 years. We are disappointed to learn that you have never actually sampled our food. It’s one of our true claims to fame. Our Executive Chef, Keith Davis, has been with our community for 20 years and has received numerous awards for his culinary skills. Additionally, he is an adjunct professor in the Culinary Arts program at Sinclair Community College. We invite you to join us for a meal during your next visit. We think you’ll be quite impressed! Thank you and your family for entrusting the care of your grandmother to 10 Wilmington Place. We value your trust and feedback, and will continue to do all we can to ensure her happiness here. Our community does not require long-term commitments or endowment fees. All you will pay is an affordable monthly rent. Relish in a lifestyle that meets your highest expectations but is a huge value at the same time. It’s easy to find the comfort, space, and privacy you want when you choose from more than two dozen unique floor plans. And to top it off, they are all at an affordable price. You can have it all! At 10 Wilmington Place, we seek to foster independence rather than dependence, while paying attention to the individuality and privacy you deserve. As your care needs change, we are here to help with activities of daily living, such as accurate medication administration, gentle reminders and guidance for personal hygiene, and proper nutrition. For the ultimate peace of mind, you are covered with a nurse on site 24-hours and emergency alert systems. Our one-bedroom and studio apartments are nearly three times larger than the average Assisted Living apartments, allowing you plenty of room to relax with family and friends. This comprehensive assessment allows us to provide customized and stimulating activities that help each individual stay active and engaged while reducing the difficult or agitated behaviors residents often experience. Bringing their own furniture, belongings and other comforts of home help residents create a sense of safety and familiarity. This supportive living environment offers studio and one bedroom apartments along with shared units that provide private rooms with a shared bathroom. Design your retirement living around the activities you love. Our Independent Living apartments are light and airy, with 13-foot ceilings and tall windows. You can choose from studios, one-bedroom, and two-bedroom apartments. With 26 unique floor plans, you are sure to find an apartment that fits your lifestyle. We welcome you to add your personal touches that make a house a home, including your small pet. We help you stay active, address pain or injury and maintain a healthy lifestyle through exercise and physical activity. We assist you in completing everyday activities to help you accomplish tasks and reach your goals to lead a more fulfilling life. We provide you with treatment and exercises to help retain or restore speech to help you communicate more easily and effectively. Thank you for your interest in 10 Wilmington Place Retirement Community. Please give us a call to schedule a free tour. What should caregivers and potential residents know about 10 Wilmington Place?